A Follow Spot: Ready for Some STICKY? Bottoms Up! Lights Down! If you saw October or December's editions of Sticky in the Sticks, a site-specific performance of ten-minute plays produced by local theatre artists, you already know you'll be there for January's Sticky, called Bottoms Up/Lights Down. 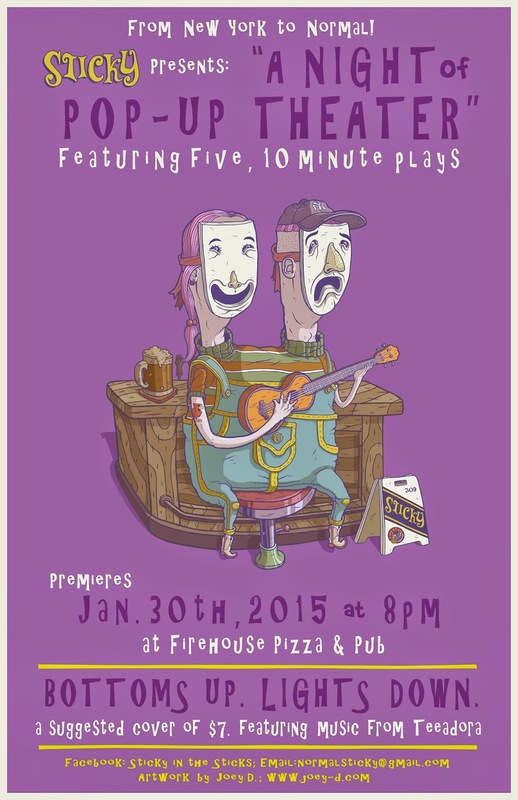 It's this Friday, January 30, at 8 pm. Connie Chojnacki Blick and J. Michael Grey are once more behind this Sticky stuff, where ten-minute plays set in a bar are... Ta da! Performed in a bar! The Bottoms Up/Lights Down evening will start at 8, but you are advised to be there a bit earlier to get a good seat (and a drink if you want one. The bartenders get busy during Sticky breaks.) Teaadora will perform live music for the first half hour or so, with the ten-minute plays beginning after that. Sticky asks for a $7 donation at the door. For more information, check out their Facebook page here, or take a look at tomorrow's Pantagraph, where Sticky in the Sticks will be featured in the GO! section.